Originally published in 2000 by Hans im Glück in German and by Rio Grande Games in English, Carcassonne is one of the early, great Euro-style board games. Currently published by Z-Man Games, it won the Spiel des Jahres in 2001 and has since gone on to become a classic and is rightly regarded as a gateway game to the hobby. Based on the town in south-west France, it sees the players attempt to build the town of Carcassonne using the game’s tiles as they see fit, constructing cities, completing roads, surrounding monasteries, and occupying farms tile by tile, and then claiming them with their knights, thieves, monks, and farmers. Since its initial release, there have been both multiple expansions for the game and multiple versions of the game, but what if Carcassonne were to fall prey to a malign meme, an insidious influence, a yammering yellow? What if there were men and women desperate enough and ready to drive themselves mad in service of a greater goal, to make the ancient Roman city not ‘Carcaso’, but Carcosa? This is almost the setup for Carcosa – A Lovecraftian board game of Cults and Madness published by One Free Elephant. It does not actually see the Yellow Sign subvert the town of Carcassonne, but it does take the same tile-laying, area control mechanics of Carcassonne the game and build on them to see rival cults—or players—race to bring the Tattered King to Earth, commanding cultists to control ley lines, conduct rituals, explore the districts of Carcosa itself as they replace our reality, and even sacrifice them to the dark waters of Lake Hali for the pleasure of the King. 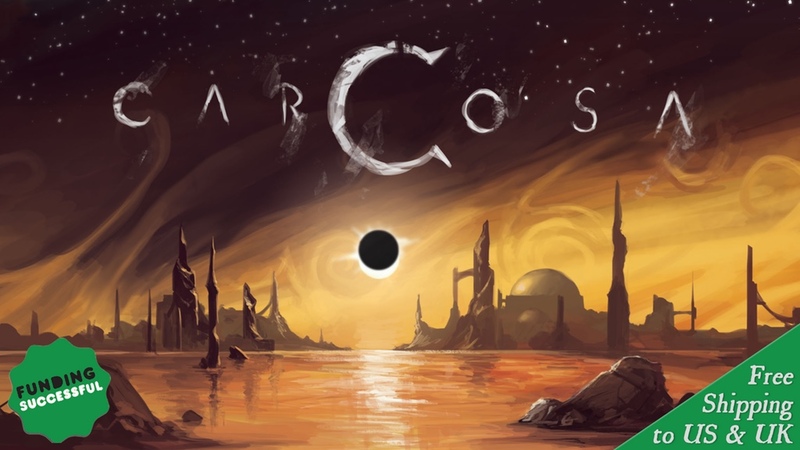 Designed for two to four players, aged fourteen and over, Carcosa can be played in about hour, sometimes less. It consists of eight-four Carcosa tiles, four Hastur tiles, a Cult Mat, four sets of ten ‘Cultists’, four sets of Ritual Stones, four Chapter House cards, four Forbidden Lore cards, and the rulebook. The four Hastur tiles are the game’s starting tiles and show parts of a District in Lake Hali. The eight-four Carcosa tiles show several types of features in Carcosa. These are Districts, Ritual Sites, Confluxes, Ley Lines, and Lake Hali. When placed each tile must be placed adjacent to an existing tile and the sides of the tiles must match. Notably, each of the Carcosa tiles is double-sided and has ‘Stable’ and ‘Unstable’ sides. When a player draws a tile, he examines it and places it so that its ‘Unstable’ side is face up. Only when a feature is completed—Districts built, Ley Lines linked, Ritual Sites surrounded, and sections of Lake Hali enclosed—will it stabilise so that the feature’s tiles can be turned over and its controlling player can harness its power. The Cult Mat is divided into two sections. The outer section is the Occult Power track which is used to track each player’s progress towards the Summoning Ritual which will bring the King in Yellow to Earth. The inner section is the Ritual Chamber with spaces for the Carcosa tiles to be placed ‘Stable’ side face down. The middle of the Ritual Chamber is marked with the Yellow Sign. This is where potential Cultist recruits can be found and ultimately, the Summoning Ritual is held to bring the King in Yellow to Earth. Each player’s ten Cultists consists of a Prophet, who sits on the Ritual Mat and controls access to the undrawn Carcosa tiles; an Oracle who keeps track of a cult’s score and progress towards the Summoning Ritual; and eight Cultists. Three of these wait on the Ritual Mat, ready to be recruited and two wait in the Cult’s Chapterhouse, one in the Asylum and one in the Recovery Room. This leaves a player and his cult with just three Cultists at start of play. Each player has access to a set of six Ritual Stones, each numbered from two to seven. By completing Ley Lines, a player can imbue these with power, the longer the Ley Line, the higher the number of the Ritual Stone which can be imbued. On subsequent turns, a player can use a Ritual Stone to gain an advantage. For example, ‘We Are Legion’ allows a player to add a Cultist to an uncontrolled feature, whilst ‘Shape the Beyond’ lets him take a Carcosa tile from the stack currently controlled by his Prophet and save it to be played later. Notably, possession of a higher numbered Ritual Stone means that it can be used as a lesser numbered Ritual Stone. Each player has a Forbidden Lore card which details the powers of all six Ritual Stones. Lastly, each cult has a Chapterhouse with two rooms, an Asylum and a Recovery Room. When a Cultist completes a feature, he is sent to his Chapterhouse’s Asylum. On subsequent turns, he will move to the Recovery Room before becoming ready to play again. This strengthens the resource management aspect of the game, since completing features will temporarily limit the number of Cultists he has from one turn to the next. A player’s turn consists of five steps—Recover Sanity, Tile Selection, Tile Placement/Replacement, Cultist Placement, and Tile Resolution. In the Recover Sanity step, Cultists are moved from the Asylum to the Recovery Room and from the Recovery Room to a player’s supply, enabling Cultists who completed features in earlier turns and were sent insane, to gain their semblance of sanity—after all, no sane man wants to summon the Yellow King. In Tile Selection, a player takes a tile from a stack which does not have a Prophet belonging to any player on it and then places his Prophet on that stack. This blocks access to that stack until after the current player’s next turn and adds a resource denial aspect to the game as the players block and unblock access to the stacks. Having drawn a tile, a player examines its Stable side to determine where to place it in the Tile Placement/Replacement and adds it to the tiles in play with the Unstable side face up. Notably, he can use this tile to replace an existing Unstable tile—as long as the sides match with the tiles it is being placed alongside. Replaced tiles are not lost, but added to the bottom of a stack to be drawn later. In the Cultist Placement step, the player can add a Cultist to the feature he has added or extended—on the Ley Lines, Districts, Ritual Sites, or in Lake Hali—as long as there is not a Cultist already on it. In the Tile Resolution step, if a feature is completed, all of its tiles are flipped over from their Unstable to Stable sides. The Cultists who completed the feature go insane and are sent to the player’s Asylum. Power is then drawn to various effects, depending upon the type of completed feature. Districts score points and advance a player towards starting the Summoning Ritual. Some Districts contain ‘theatres’ which allow a player to recruit additional Cultists. Ritual Sites are completed when surrounded by eight other tiles. This scores a player more points, but if the Ritual Site is home to a feaster—something that only the placing player will know—it devours the Cultist on the Ritual Site and any Cultists in the surrounding waters of Lake Hali. Although this scores points for all players whose Cultists are devoured, these Cultists are sent to the Cult Mat and cannot rejoin the game unless recruited via a District with a Theatre. Although this scores points for everyone involved, it can be used as a means of denying Cultists to a rival player. A player can sacrifice a Cultist to Lake Hali to score points, though this will reduce the number of Cultists he has to hand. By completing a Ley Line, a player will imbue a Ritual Stone, unless it is connected to an ‘Empowered Conflux’, in which case, he will imbue a Ritual Stone and score points. Play continues until one of two conditions are met. If two stacks are depleted on the Cult Mat, the game ends, players score for any incomplete features they control, and the player with the most points takes control of Carcosa and wins the game. This is the less interesting of the two conditions. The more interesting condition occurs when a player’s Oracle reaches the end of the scoring track on the Cult Mat and so can begin the Summoning Ritual. This requires him to complete three more features and send their corresponding and now insane Cultists to the Cult Mat (instead of the cult’s Chapterhouse). The first player to do so, brings the Yellow King to Earth and wins the game. Carcosa quite literally brings several new twists to Carcassonne and its style of play. Cultists being sent insane by completing features and their need to recover imposes a strong resource management aspect, whilst the ability to complete a Ritual Site and sacrifice Cultists of any player enforces this—though they do extra points for these sacrifices. So a player needs to be very careful not to overcommit his Cultists lest he exhaust the numbers he has to place. The ability to block access to the tile stacks gives another tactical aspect to play. The Unstable/Stable aspect of tile placement adds a sense of mystery and hidden play to the game, but being able to replace an Unstable tile can be very powerful, especially if it changes the effect of a tile, such as connecting a Ley Line to an ‘Empowered Conflux’ or changing a Ritual Site to one with a Feaster—or vice versa. That said, while the Stable/Unstable tile mechanic is clever, it can be fiddly when it comes to flipping them over, so players do need to be careful. Above all, the Summoning Ritual as the end game condition makes the game a race, one that any player can still catch up to if he is behind as well as slowing a player down who is attempting the Summoning Ritual. In addition, the Ritual Stones can give a player an advantage just when he needs it. All of those does mean that there is much more to learning to play Carcosa than Carcassonne and that the game’s full details will really come out after a few plays. Thematically, Carcosa is a delight. Its artwork and the Cultist meeples—this is a Carcassonne-style game, so each player’s Cultists are always meeples—bring an ominous sense of dread and doom to the game play, yet without overpowering it. There no great Mythos creature or entity lumbering into view, but always a sense of building towards something insidious and despairing. At its core, the game play remains simple, but Carcosa does add several degrees of complexity to Carcassonne’s mechanics, moving the game well away from being a gateway game as does the theme, which is more adult and darker in tone. Another reason it is not a gateway game, is that the complexity means a greater range of tactical options, perhaps slightly too many for casual play. That also means though, that the players have more opportunity to be tactical—not just in terms of their tiles and where to place them, but also which tile stack to block, when to play a Ritual Stone, when to sacrifice everyone’s Cultists, and so on. Of course it could be argued that Carcosa is an overly complex version of Carcassone, but then the players are trying to perform a Summoning Ritual and what ritual is ever easy? Yet the complexity is born of a design combination that is clever and in places novel, bringing both mechanical depth and thematic depth to a design classic. Ultimately though, the cleverest aspect of One Free Elephant bringing Carcosa to Carcassone is not noting the connection, which was there for all to see, but making the connection in terms of theme and game—such that you have to wonder why no one made the connection before. Carcosa – A Lovecraftian board game of Cults and Madness is currently being funded via a Kickstarter campaign.